The bitcoin community was abuzz yesterday when, during an appearance before a Congressional committee by Federal Reserve chair Janet Yellen, an attendee held aloft a “buy bitcoin” sign. The image of the sign quickly went viral, though the attendee and his friend were ultimately asked to leave by a staffer. Soon after his appearance, it emerged that the individual is a friend of a cryptocurrency trader who tweets under the handle CryptoEthan. 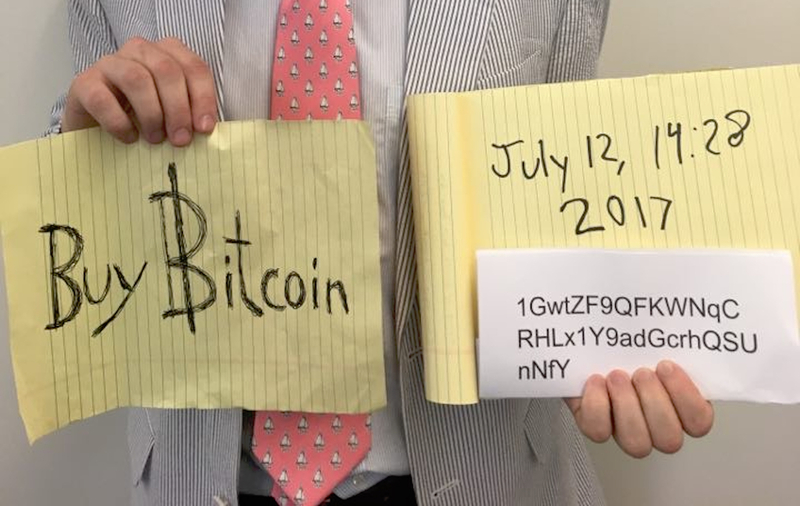 He posted a picture of the person – soon known as the “Bitcoin Sign Guy” – who, in addition to holding up the now-infamous sign, shared a bitcoin address as well. As of press time, that address has garnered 6.32570673 BTC, an amount worth just under $15,000 at current prices. While most of the transactions involved, numbering 556 according to Blockchain.info, were small in scale, one notable contribution was for 1 BTC. The photo that included the address was ultimately deleted at the Bitcoin Sign Guy’s request, though he later visited the nonprofit advocacy group Coin Center, which is headquartered in Washington, DC. The viral activity spurred several scam attempts, with some accounts posting Photoshopped versions of the original picture with new addresses.